AMSTERDAM, NETHERLANDS, September 14, 2018 /EINPresswire.com/ — Touchstream, the leading provider of video streaming content availability monitoring, today announces the next version of its comprehensive end-to-end monitoring solution, StreamE2E. 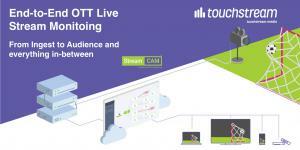 When Touchstream announced the available of StreamE2E during the BVE event in early 2018, it was a first for the streaming video industry—a monitoring solution that developed a clear picture of cloud-based video delivery workflows so that streaming service providers could not only ensure better QoS/QoE for their subscribers but do so proactively to prevent possible churn due to a poor experience. StreamE2E enables streaming video providers to see a complete end-to-end picture of their workflow and delivery, enabling them to replace traditional hardware-based monitoring probes with a cloud-based solution that addresses their growing use of distributed software technologies to prepare and deliver video. This new version of StreamE2E includes a much better workflow visualization that also includes external data sources. Like the previous version, video distributors get a clear picture of their entire cloud-based delivery workflow enabling them to proactively track down problems (such as when a specific bitrate isn’t available) and resolve them before they become customer-service issues. Additional integrations will continue to be developed. Sharing the data with providers has been proven to significantly reduce issue diagnosis time and enable quicker resolution to resolve quality-of-experience problems before they significantly impact subscriber churn. Touchstream’s StreamE2E platform will be on display at IBC Show in Amsterdam, Netherlands, hall 14, booth D34.